Incense Oud brings By Kilian's Arabian Nights to a point of some existentialist questions. Are these oud-centric perfumes orientals? Arabian-style? Utterly French? As Denyse of Grain de Musc points out, Incense Oud is as much a fantasy of the Orient as is Shalimar. With a note list that includes cardamom, pink pepper, Turkish rose, Egyptian geranium, methyl pamplemousse, cedarwood, Indonesian patchouli, Indian papyrus, Somalia incense, sandalwood, Macedonian oakmoss, Spanish cistus labdanum, and musks, the absence of real oud is pretty obvious. The other By Kilian ouds, Pure Oud and Rose Oud, both gorgeous perfumes, were indeed, more fierce compared to this new release. But Incense Oud does feel quite oudish, at least in its top notes and on my skin. When the husband tested it the impression was a lot more like a spicy woodsy rose, closer perhaps to Caron Oud, that he seems to prefer. But back to Kilian's. Incense Oud smells both plush and austere, if that's even possible. The soft impression that exists for most of the perfume's life span is rich and indulgent. Those are some fine spices, leaves, petals and woods. It's a smell good/feel good thing that makes one all dressed up even if you're still lounging in your PJs. Later, when the various incensy parts take over things get serious. There's a lot of real incense oils in this composition, and while it's not an emotional overdose as you get in Andy Tauer's magnificent Incense Extreme, Kilian and his perfumer, Sidonie Lancesseur, were not kidding. This is incense and it gives that resinous smoky impression that often comes with real oud. Together with the rosy notes, the whole thing looks and smells like a big budget production. Does it matter that Incense Oud is not real oud and as westernized as it gets? I don't think so. It's a beautiful scent, luxurious and very well-done. I don't exactly dream of the Taj Mahal when I wear Shalimar or a Japanese pagoda when I indulge in Mitsouko, so I'm pretty fine with Kilian Hennessy’s vision and the way it was executed in his Arabian Nights collection. By Kilian Incense Oud ($395, 50 ml EDP) is available from Bergdorf Goodman, Saks (select locations), Luckyscent, MiN New York (minnewyork.com)and select Neiman Marcus locations. I was given a free sample at Bergdorf. 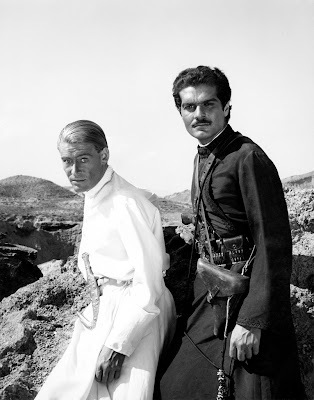 Photo of Omar Sahriff and Peter O'Toole from the movie Lawrence of Arabia, 1962 (stirredstraightup.blogspot.com). Aahhhh...Omar Shariff and Peter O'Toole...sorry, what were we talking about? While I understand what Killian is trying to achieve, I feel his fragrances are in need to soul. He needs naturals or at least in greater quality. Pretty packing and synthetics is like a beautiful model without a brain.